As Sir George Stokes was not disposed to admit that the aether could pass freely through the interstices of material bodies in the manner required by Fresnel ’s views, and as any other theory of its motion which could be consistent with the fact of astronomical aberration required irrotationai flow, an explanation of the limitation to that flow had, he considered, to be found. This chain of argument, that motion of bodies disturbs the aether, that aberration requires the disturbance to be differen-. tially irrotationai, that this can only be explained by the - dispersion of incipient rotational disturbance by transverse waves, and further that radiation itself involves transverse undulation, he regards as mutually consistent and self supporting, and therefore, as forming distinct evidence in favor of this view of the constitution of the aether. . . . The question then arises how far this explanation will extend to the case in which the aether is entrained by the matter that is moving through it. Attention has already been drawn to Sir George Stokes’s considerations which would make the luminiferous property itself prevent the initiation of any rotational motion in the aether. It is in fact not difficult to prove that the energy of strain of a rigid incompressible medium of the type of ordinary matter may be expressed as a volume integral involving only the differential rotation, together with surface integrals extended over boundaries; and it follows that any local beginnings of rotational motion in an aether of elastic-solid type would be immediately carried off and distributed by transverse waves, so that if the rigidity is great enough no trace of rotational motion ef the medium in bulk can ever accumulate. 6 February, 1920, Vol. 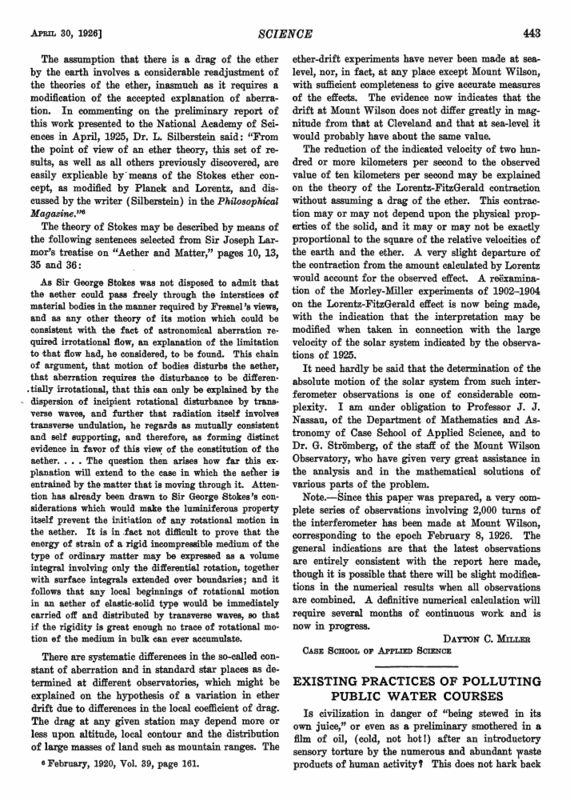 39, page 161.
ether-drift experiments have never been made at sea-level, nor, in fact, at any place except Mount Wilson, with sufficient completeness to give accurate measures of the effects. The evidence now indicates that the drift at Mount Wilson does not differ greatly in magnitude from that at Cleveland and that at sea-level it would probably have about the same value. The reduction of the indicated velocity of two hundred or more kilometers per second to the observed value of ten kilometers per second may be explained on the theory of the Lorentz-FitzGerald contraction without assuming a drag of the ether. This contraction may or may not depend upon the physical properties of the solid, and it may or may not be exactly proportional to the square of the relative velocities of the earth and the ether. A very slight departure of the contraction from the amount calculated by Lorentz would account for the observed effect. A reexamination of the Morley-Miller experiments of 1902-1904 on the Lorentz-FitzGerald effect is now being made, with the indication that the interpretation may be modified when taken in connection with the large velocity of the solar system indicated by the observations of 1925. It need hardly be said that the determination of the absolute motion of the solar system from such interferometer observations is one of considerable complexity. I am under obligation to Professor J. J. Nassau, of the Department of Mathematics and Astronomy of Case School of Applied Science, and to Dr. G. Stromberg, of the staff of the Mount Wilson Observatory, who have given very great assistance in the analysis and in the mathematical solutions of various parts of the problem. Note.—Since this paper was prepared, a very complete series of observations involving 2,000 turns of the interferometer has been made at Mount Wilson, corresponding to the epoch February 8, 1926. The general indications are that the latest observations are entirely consistent with the report here made, though it is possible that there will be slight modifications in the numerical results when all observations are combined. A definitive numerical calculation will require several months of continuous work and is now in progress.